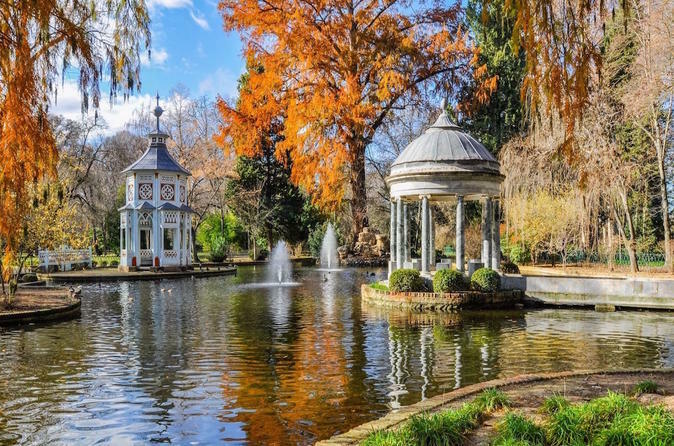 Start your tour from your centrally located hotel in Madrid and head out 50 Km to the south where the great villa of Aranjuez lies. This is the most southerly city of the province. Once you are there, you will have the opportunity of visiting some of the following most interesting sites in town. In fact, it is not just one garden, but several. With a 7 Km perimeter and covering 150 hectares. It is one of the largest gardens in Spain, 32 hectares bigger than El Retiro Park in Madrid. It is a landscaped garden that follows the English and French fashions of the end of the 18th century, although there are some older elements, such as the ‘Spring Garden’ and the ‘Pier of King Fernando VI'. The Prince’s Garden is surrounded by the river Tajo, and along the paths are a great number of plant species, many of them brought from distant lands. Its most important architectural works are the garden gates, the Apollo fountain, the ‘Chinescos’ pond, and the ‘Labrador’ house. It is situated inside the Prince’s Garden, and it contains one of the most spectacular collection of boats used by the Spanish monarchs to navigate the river Tajo. In the 16th century, Philip II of Spain ordered the old ‘Maestral’ house of Aranjuez to be replaced by a new building which became the foundation of the present Royal Palace. The work was never completed, and the site was virtually abandoned until the reign of Philip V of Spain in the 18th century. Later, successive monarchs extended and renovated the building. The Musicians’ Antechamber - the Throne Room - the Arab Salon - the Porcelain Room - the Queen’s Bedroom - the Dance Hall - the Banqueting Room - the Hall of Mirrors - the King’s Office - the Salon of Chinese Art.. The garden lies next to the east façade of the Royal Palace. It is laid out in the French-style, and is also known as ‘Little Versailles’. It contains some spectacular fountains, such as Hercules and Anteus, the goddess Ceres, and the Nereids. Among its attractions special mention must be made of the Chilean Auracaria pine, or Monkey Puzzle tree, an specimen in the province of Madrid. Can be reached via the Parterre garden. This garden is so-called as it is surrounded by the river Tajo, and separated from the Palace on its southern side by an artificial stream, which forms the famous ‘Castanets Cascade’. It is an example of an Italian-Flemish renaissance garden. Its fountains recall Greek mythology: the fountains of Venus, Apollo, Bacchus, etc. It has a enormous size and a semi-open aspect. Its name is derived from the paired ‘horse dancing’, which was avidly watched from the balconies of the buildings that enclose it.